I am writing this post as I munch on a Miette chocolate macaron that my husband bought me. 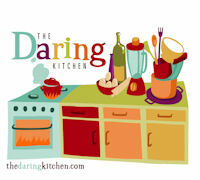 That should tell you how well my macaron making experience went during this month's Daring Bakers' challenge. Ami S. asked us to make macarons using a recipe from Claudia Fleming’s The Last Course: The Desserts of Gramercy Tavern. We could use any filling our hearts desired. 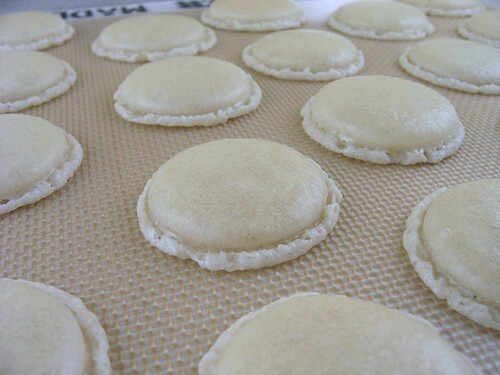 I have always wanted to make my own macarons, but laziness usually prevails. It's much easier to just pop over to Miette or Paulette (both in Hayes Valley near my beloved Blue Bottle), but they can be pricey at $1.50 and $1.60 each respectively. I never leave without 2 macarons. And more often than not, it's more like 6 or 12! But the DB challenge was a perfect opportunity to try making them myself. I read posts by Helen, Duncan and Veronica. I watched videos in French even though I couldn't understand 90% of what they were saying. I religiously read the DB private forums about macaron making. I ordered an insanely large bag of blanched almond flour online and stocked up on plenty of eggs and confectioners' sugar. And I started early in the month, soon after the challenge was first announced, which is uncharacteristic for me since I always wait until the very last minute to try the recipe. The great part about starting so early was that I was able to try the recipe many times before the posting date. Unblanched (skin-on) almonds (Trader Joe's almond meal). I aged my egg whites at room temperature for 24 hours and whipped them to stiff peaks. Single sheet pan. I tried both parchment and silicone baking mats. No problems removing the macarons from the pan using either. 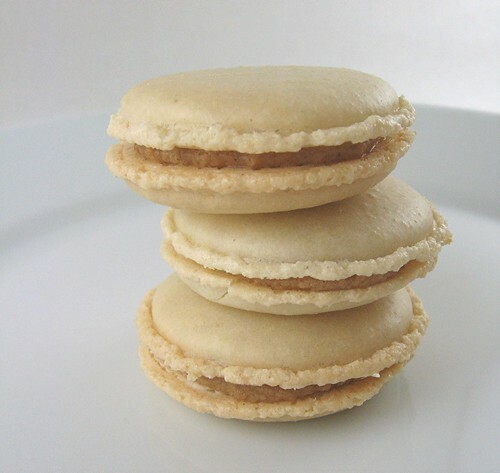 Macarons have the ruffled foot, but the foot extended beyond the border of the shell. Some had fissures and cracks. Helen's advice was to mix less and to stack a second sheet pan underneath the first to promote even heat distribution. 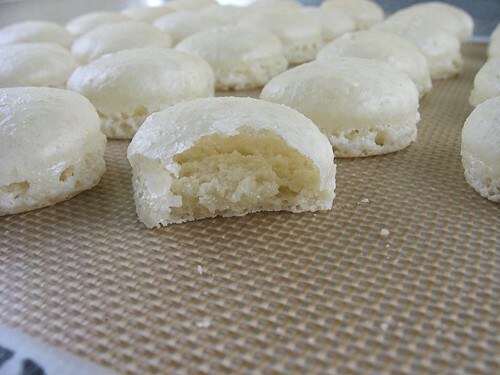 The almond skins gave the macarons a more pronounced almond flavor, but the skin-flecked shells appeared less refined than ones made with blanched almonds. Attempt 1: Batter flattened out nicely. Attempt 1: Some shells developed fissures. Blanched (no-skin) almonds (Honeyville almond flour). I aged my egg whites at room temperature for 24 hours and whipped them to stiff peaks. I used a second sheet pan and silicone baking mats. No problems removing the macarons from the pan. I was careful to gently fold in the almond-sugar mixture into the beaten egg whites. The ruffled foot did not extend beyond the border of the shell (yippee! - that's how it's supposed to be). But I had a huge air pocket under the shell (blah! - not what I want) and they looked like hamburger buns which my taste testing co-workers found amusing. 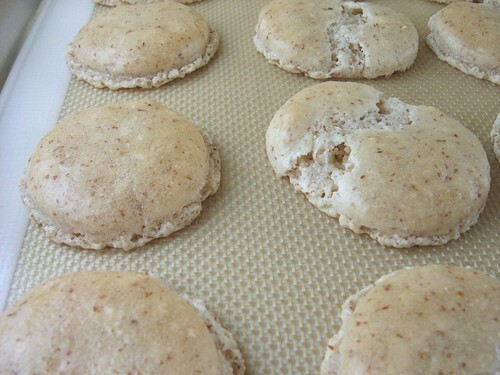 Using blanched almonds gave the macarons a more delicate flavor than those made with unblanched almonds. Attempt 2: Foot ruffle good, air pocket bad, looks like hamburger bun. Blanched (no-skin) almonds. I aged my egg whites at room temperature for 24 hours and whipped them to stiff peaks. I used a second sheet pan and silicone baking mats. After watching some how-to videos and reading the DB forums, I decided to mix in the almond-sugar mixture with purpose instead of gently folding. Advice was to "fold and press" to incorporate the almond-sugar and to somewhat deflate the batter. The batter should be smooth and "flow like magma". Also, I tested the batter by making sure a ribbon of batter drizzled on top of the rest of the batter would disappear within 30 seconds. After piping out the batter I also gently rapped the sheet pan to release any large air bubbles. My baked macarons were flatter than in attempt 2, but the ruffled foot extended beyond the border of the shell and I still had that pesky air pocket under the shell. 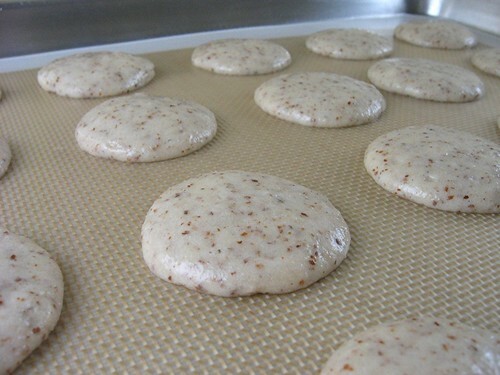 The macarons would not come off the silicone baking mat even after letting them cool for a couple hours. So I had to bake them in the oven until they would come off. That extra baking time darkened the shells to a light golden brown. They still tasted good but a bit toasty. The photo at the beginning of my post is from attempt 3. Attempt 3: Shells darkened from extra baking to get them off the silicone mat, darned air pocket still there. Method and results identical to attempt 3, but I didn’t bother re-baking them to remove them from the silicone mat. I just scraped them off the silicone mats with an icing spatula. They were a sticky mess but the thin delicate outer shell remained intact. Attempt 4: I just can't get the ruffled foot right. Even though they all tasted really good with the salted almond butter filling I made, I would consider all four attempts failures. Attempt 2 had the best ruffled foot as it did not extend beyond the border of the shell. Attempts 3 and 4 had the right flat shaped but the ruffle was wrong and I still had that air pocket. I need to figure out how to get rid of the air pocket! It happens when I gently fold the almond-sugar mixture into the beaten egg whites and it also happens when I "fold and press" with purpose. I am getting pretty good at piping out the macaronage into circles of the same size. I am now officially obsessed with making them over and over again until I get it right. Then I will no longer need to buy them anymore. 3. Sift a third of the almond flour mixture into the meringue and fold gently to combine. If you are planning on adding zest or other flavorings to the batter, now is the time. Sift in the remaining almond flour in two batches. Be gentle! Don’t over fold, but fully incorporate your ingredients. 6. 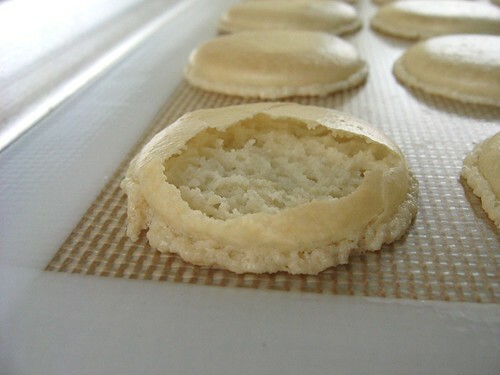 Bake the macaroon for 5 minutes at 200°F (93°C). Remove the pan from the oven and raise the temperature to 375°F (190°C). Once the oven is up to temperature, put the pans back in the oven and bake for an additional 7 to 8 minutes, or lightly colored. Combine all ingredients and only 1 tablespoon of almond milk in a mixing bowl. Stir until well combined and smooth. Add the remaining 1 tablespoon of almond milk if it's too stiff. Goodness! What a lot of work you did on this challenge. I love the tall "hamburger" bun ones even though they were hollow. So pretty! The filling sounds wonderful. Really impressed with your effort. oh you put in an immense lot of effort into these - bravo! i think i would have given up at attempt 2! you did well and i really like the sound of the filling! 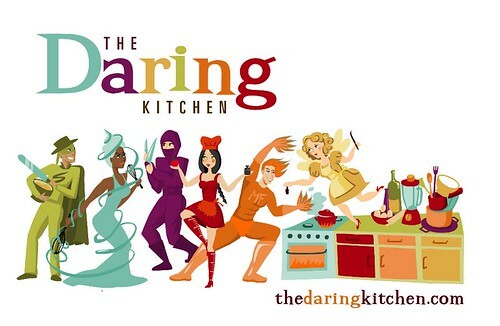 If you want to avoid the air pocket, try a cooked meringue recipe! I think your macarons look just fine! Its certainly not easy to get feet and a nice billow. Your fillings are great too! Love that filling. Making macarons is a lethal cycle, isn't it. I don't think anyone ever stops even after they've mastered it! I am so glad you continued even though the 1st attempt didn't work out. The end result is fantastic - I am so proud of you. You really are a DBaker. nice, they look good to me? Very well done! Like you, my first batch wasn't entirely satisfying! I love that choice of filling! You were so methodical with your attempts that I'm sure you will get it right soon. Keep macaroning! Wow, and you say that's a failure?! I often get the "burger bun" look - mixing a couple more times helps, imo. But the last batch looks just about perfect! And the filling sounds delicious. Wow, way to go experimenting with the recipes! It's awesome that you even got feet in your first attempts. Great job! Honestly, I think all of your macarons look perfect =D. Love the flavours and textures. Wonderful job on this challenge! Nice work with the challenge and I like the idea of the salted sweet filling. Keep at it. I went to eight batches and only had one success out of the lot. Love the almond butter filling! 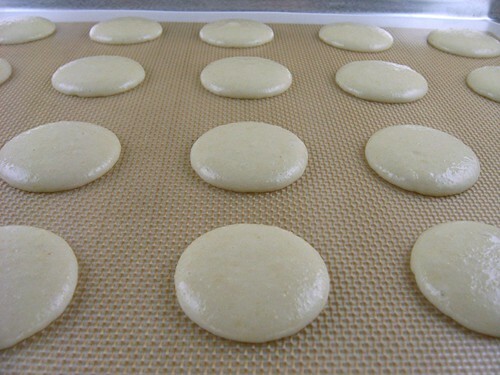 I think macarons are about process, which you have clearly mastered, and your results are a success in themselves! Well done! Even with a few glitches, you definitely got a bit of success in there. Mine failed so epically that I couldn't even dare to take a picture! I may be way off here and, like you, had understood that room temp. egg whites beat up the best. Recently I've read that room temp is NOT the best- that whites out of the refrigerator for only about one hour make the best meringue as the air pockets in the cooler whites are smaller and make a tighter "meringue"...makes sense to me 'tho I've not tried meringue since we've had nothing but rain here for the last six months...and every good (Southern) daughter who listened well to her mother and grandmothers knows that you "cannot make meringue in rainy weather". I know you've not given up on your macarons. When the sun comes out again, I'll join you in the effort and hope this helps. Matthew F - Thanks for the tip. I will definite try that the next time I make these.